Lunch is often a haphazard affair — attempts to coax the neglected bits and bobs lurking in our fridge into a cohesive meal. Occasionally, these attempts are actually successful. Today I had a success, so I decided to record it here. Of course, you can use any noodles (cooked) in place of the shirataki, but I think that even aside from the supposed health benefits, I like these noodles because of their convenience: they don’t require cooking, and they hold up remarkably in a stirfry. No need to worry about them turning to mush or becoming over-cooked. I have a soft spot for broccoli stems because they are often cruelly composted after having been separated from their more desirable floret counterparts. But they are so delicious, especially after a short stint in a hot pan. Finally, I was so relieved to be rid of the three-month-old century egg hanging out in my fridge (we bought a six-pack to make century egg porridge). It turned out to be a delicious, creamy counterpart to the rest of the dish. You could really throw in any leftover protein here, though. In July, I decided to start a granola business. I’d been making granola for a few months, and have always felt strongly that granola as a food product is terribly overpriced and oversweetened. Needless to say, the entire process was far more involved, exhausting, and discouraging than I could have imagined — and I’m a pessimist to begin with. But I’m still going at it, and I thought it would be helpful for me to distill all the granola-making lessons I have learned along the way. The whole process has felt like a (sometimes poorly-planned) science experiment — I keep a notebook where I scribble all my recipe tweaks and notes, and have a huge spreadsheet where I track ingredient costs and weights and suppliers. Karl has had to put up with our house feeling like the tropics and smelling like cookies almost every single day. The worst bit is probably all the food wastage that feels unnecessary but is a sadly necessary part of the whole process. Still, there’s something feverishly exhilarating about the whole process. I know I’m just making granola, but sometimes I feel like a mad scientist. SO, here is my base recipe, and probably more than you ever wanted to know about the process of making granola. Mix the dry ingredients thoroughly in a large bowl. Combine olive oil and maple syrup well, and pour into dry ingredients. Mix, mix, mix! Make sure everything is well-coated with liquid. Spread evenly onto a baking sheet, and pat down gently with a spatula. Bake for 30-40 mins (depending on your oven). I recommend checking and stirring after 15 minutes; if it looks like the granola is browning rapidly, you can turn the oven down to 250 F to be safe. The granola will not be fully crisp when you take it out, but it will be once it has cooled. Most recipes recommend an oven temperature from 300 – 350 F. In my personal experience, anything over 300 F is way too hot; granola burns easily and is too crunchy/hard. I’ve found that for recipes sweetened with maple syrup and without coconut flakes, 300 F for ~40 minutes is safe. For recipes with honey (which seems to burn more easily than maple syrup) and coconut flakes (which also burn more easily than nuts, especially if they’re really thin), I prefer to go with 250 F for ~60 minutes, stirring every 20 minutes. A huge factor in how fast your granola bakes is how thick your layer of granola ends up being on the sheet pan, and the volume of granola you are baking. The recipe amount stated above works well with a quarter sheet pan (9″ x 13″). Also, if the recipe does not contain enough liquid — say, if you decrease the sweetener or oil, or replace some with brown sugar — it will burn faster. I started out making this granola with 80g of maple syrup, and received a lot of feedback that it was too sweet. However, when I dialed back on the syrup, I failed to adjust the amount of salt accordingly, which messed up the salt:sugar ratio — the granola was way too salty. So if you do end up increasing/decreasing the amount of syrup, I would recommend adjusting the salt level accordingly. The level of sweetness in this recipe is just about right for me — about 5g of sugar per serving — but sometimes I do want it even less sweet. It depends what you want to eat your granola with: I typically have mine with plain, unsweetened yogurt, which is pretty tangy, but if you’re having it with milk, you might be happy with a granola that is less sweet. If you’re going to cut back on the maple syrup, I would suggest replacing it volume-wise with applesauce (which is much less sugar-dense), so that there’s still enough liquid to keep the granola tender. In my haste, I sometimes didn’t mix enough — the dry ingredients, the wet ingredients (you want it to emulsify as much as possible), and the dry-wet together. The worst that can happen is unpleasant clumps of overly-salty granola. Don’t underestimate the importance of the kitchen implements that you use. 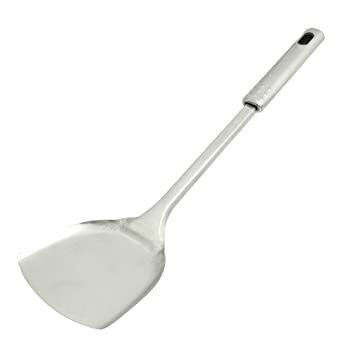 I’ve found that the best tool for patting and stirring granola is a thin metal spatula (something like this). For scooping baked granola into containers, I like large metal scoops. For mixing, big rubber spatulas are great. It’s really important to cool the granola *fully* before attempting to add in heat-sensitive ingredients like chocolate chips or attempting to store the granola. Good test: feel the bottom of the sheet pan — it should be room temperature. It takes about 30 minutes for me with the pan on a cooling rack. If you’re in a pinch, you can stick the whole pan in the freezer. Store in an airtight container. My preference is to keep granola refrigerated in mason jars; it seems to keep well this way for at least a month. I want to experiment with infused olive oils, because I love the flavor from citrus zest but don’t love the effort it takes to zest oranges/lemons. I think zest/powdered spices also impart a slightly powdery texture to the granola. It would also be cool to try different types of salt. Good luck with your granola-making!